They say that good things come to those who wait, and that’s certainly the case with my moviegoing year, as my two favorite films were released in the last days of 2014 (all the better to remain fresh in Oscar voters’ minds). On the surface, A Most Violent Year and Selma might not seem to have much in common, aside from the presence of the exotically named up-and-coming actors David Oyelowo and Alessadro Nivola in their casts. But dig deeper and you’ll find they share more than you might expect. They’re both period pieces, albeit of very different times and places. Selma, of course, follows the Alabama march led by Martin Luther King Jr. (Oyelowo, in a performance that seems touched by grace) that resulted in the Voting Rights Act of 1965. 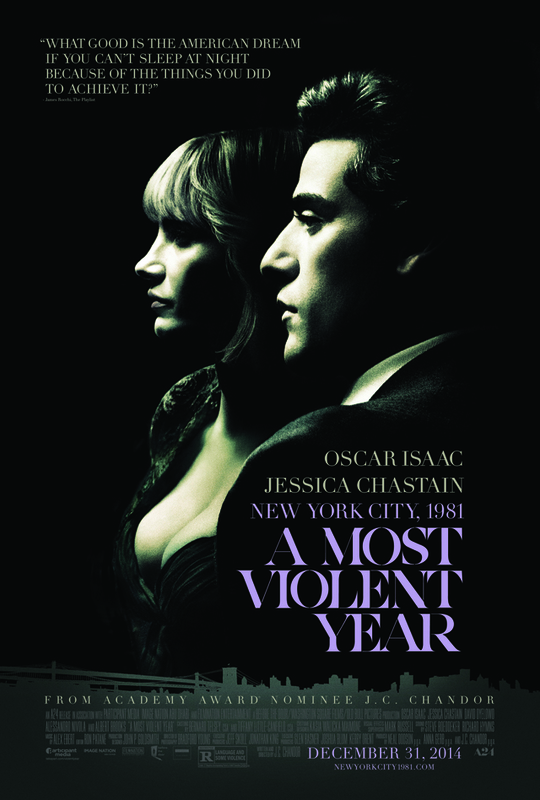 A Most Violent Year takes place in a pre-Giuliana, graffiti-strewn 1981 New York City, where a local heating-oil company owner (Oscar Isaac, simmering like a young Al Pacino) fights to save his business against threats from mobbed-up competitors as well as a crusading DA (Oyelowo). At their hearts, they’re each stories of flawed men struggling to stay on a straight, non-violent path, despite the moral corruption that surrounds them and pressure from alleged allies to resort to more brutal tactics. They’re also finely observed portraits of complicated marriages, as MLK and wife Coretta (the beautifully restrained Carmen Ejogo) grapple with his infidelity and Isaac’s Abel Morales attempts to mollify his more aggressive better half, Anna (Jessica Chastain, who continues her run of remarkable work with a steely yet surprisingly understated turn). Selma and A Most Violent Year represent the best films yet from a pair of promising and supremely gifted young directors, Ava DuVernay and J.C. Chandor. It’s only the third feature made by each (after DuVernay’s micro-budget indies Middle of Nowhere and I Will Follow and Chandor’s star-studded yet small-scale Margin Call and All is Lost), and their storytelling canvases keep expanding, as does their visual sophistication. 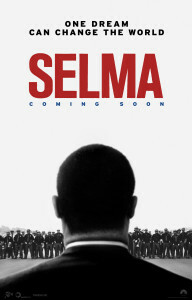 While Chandor thrillingly conjures the gritty cinematic spirit of the late Sidney Lumet (Serpico, Dog Day Afternooon, Prince of the City), DuVernay seems to be developing a style all her own, with signature shots of the backs of men’s heads—brilliantly echoed in Selma‘s poster—and a focus that can expand from intimate extreme close-ups to breathtaking epic landscapes. These two spectacular movies cap off the most exciting cinematic year in recent memory. Here’s the rest of my top 10 list, with links to longer reviews in some cases. What were YOUR favorite films of 2014? Let me know below! Well, we share 4 out of 10–that’s more than usual! Fantastic piece! “Selma” was already on my list of movies to watch, and I will now happily add “A Most Violent Year”, as I also loved Oscar Isaac in the Coen Brothers’ “Inside Llewyn Davis”. Hurray! I think you’ll like it. And despite the title, it’s not even that violent! Two criminally underrated movies I saw in 2014 — tho they may technically be 2013 — were “Mistaken For Strangers” and “The Inevitable Defeat of Mister and Pete.” Both deserved raves. Also, loved Jill Soloway’s “Afternoon Delight” and Cathryn Michon’s “Muffin Top.” Fabulous year for movies.